The weather today has been very changeable. Its gone from bright sunshine to heavy rain, then back to sunshine - then more rain. I tried to fit mowing the lawns in between showers but didn't quite make it. I had just started the back lawn when the rain came down so I just carried on regardless and got soaked to the skin. Didn't get the grass in the cat enclosure done though so that can wait for another day. As I couldn't do any more outside chores I reluctantly made a start on the ironing pile. Did as much as I could before my back started aching. 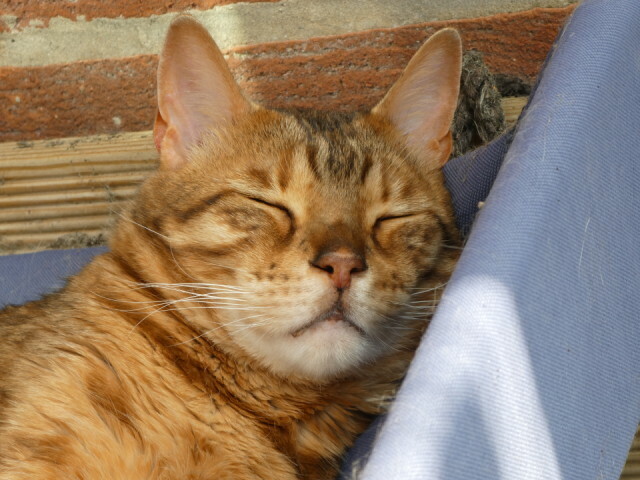 As you can see from my blip shot Tino made the most of the sunshine to have an outdoor nap.